Hey, New Orleans, can we talk about Sunday for a minute? 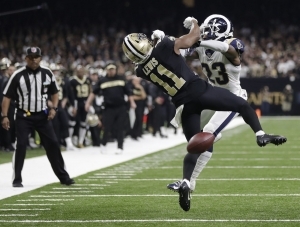 It’s well documented that Saints fans are upset about the no call in the NFC Championship Game; in fact, I wouldn’t be surprised if there was a forearm tattoo of the intolerable incident etched in ink in order to let everyone know that you, as a collective fan base, won’t stand for the injustice that occurred in the Mercedes Benz Dome! To be honest, any complaints are justified because it was an obvious missed call. Hell, Nickell Robey-Coleman admitted it himself! There isn’t anyone alive that would argue that the no call on the field was the correct call.Again, the outrage is fine, because “fan” is short for “fanatic”, after all, so throw your Twitter tantrum and drink your excessive amount of beer, and this will all blow over. Unfortunately, an absurd amount of alcohol and complaining on social media isn’t enough for two New Orleans season ticket holders who have filed a law suit against the NFL. These two fans not only want the NFL to admit that they were wrong (that would be too easy), but they also want Roger Goodell to enforce a rule (that no one has ever heard of) that would allow the NFC Championship to restart where the penalty should have been called. Not only is this lawsuit ridiculous, it’s also pointless and laughable! Who in their right mind thinks that the NFL is going to be denied a Super Bowl? Especially when the two teams involved have already been used in promo after promo used to endorse the event! The answer to this obviously rhetorical question is NO ONE! The Super Bowl is the crowned jewel of the goliath that is the NFL! Anything that dares to try and rob them of that jewel will be destroyed where it stands. I wish New Orleans fans would have just wallowed in their own self-pity for a while and then moved on. Use your brains for a second. Why would I wish that? Because this lawsuit and the “We won’t stop until we get what we want” message that it’s sending is removing the relatable sentiment that we all feel for the Saints and their fans, and it is pushing them an inch closer to being the new UCF. Who remembers UCF? Remember how awesome it was that they went undefeated and got a shot at Auburn? Remember when they beat Auburn and most people let out a collective “good for you”? I’m glad someone does because all I remember are the obnoxious rings, banners, and parades that followed a fan base and university that wouldn’t stop until they got what they wanted. New Orleans, let me be your voice of reason! As an Oklahoma fan, I can relate to being robbed of glory (just watch the 2006 game in Eugene). As a voice of reason, listen to me when I say this: Replace the lawsuit with a pitcher of your favorite beer, put a picture of the referee who missed the call on your dart board, and just MOVE ON! Maybe you won’t become as bad and obnoxious as UCF, but if you keep it up, then we will laugh at you just as much as we did at them. Don’t be UCF. It’s never ok to be UCF.